Threadmarks IGDB Developer comments on site and redesign! Thanks a lot for the mention! and likewise to GGapp, we're big fan of what they're doing and we quite often get to chat with the founder as the app is using the IGDB API, cool dude too! Same goes for the apps of course, we have plans to go back and update them in particular the Android version. 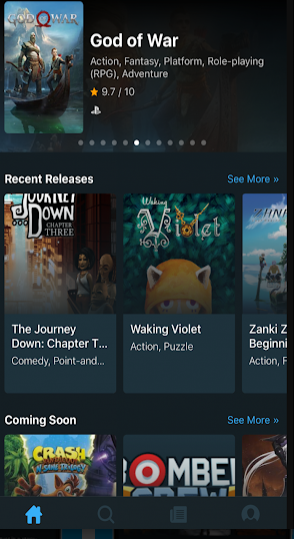 While the iOS app has the custom list features and a few other cool bits, the Android version was the very first app we made and is now lagging a tad (and as an Android user myself i'd be keen on making it a priority :p). We're a pretty small start-up and a big chunk of last year was spent on developing a new version of our API, which we unleashed just before Christmas. Meaning that ideally 2019 will have a large focus on going back to develop to the website and apps. Stay tuned! If you folks have any question i'm happy to answer anything, kinda new to resetera though so i'm not sure what flies in here. Here's some screenshot of the upcoming redesign (subject to change of course, work in progress). We're pretty open and happy to discuss suggestions and features, drop in on Discord if you have any ideas you'd like implemented! He meant that similarly to GiantBomb we make all the data and information from IGDB available externally via the API, which powers many sites and projects. For example, Twitch uses the GiantBomb API to display game information, and relevant to this thread GGapp actually makes use of the IGDB API. To my knowledge GiantBomb doesn't have a Letterboxd type service, but their API might be used for one. I've been after one for ages, I've tried pretty much every single one out there. I even started making my own at one point lol. Never seen GG before though, will be keeping my eye on it. Putting this on my watch list cause I've been wanting a service like that for ages. I use True Achievements for Xbox 1 & 360, True Trophies for PlayStation 3, 4 & Vita, and True Steam Achievements for, well, Steam! You can link them all together but you can't really see your whole collection in one place. They're great sites for tracking your stats though and most importantly seeing what you need to do to unlock the remaining achievements. Those prototype images look amazing, sighAlot! Looks like exactly what I'd want. This looks really great… Any plans for dark theme? I remember trying a few of these types of sites about 10 years ago. Not my thing, but I'll pay attention to these. We'll be using Google's material design as the base framework, which makes it super simple to toggle different theme. Love Letterboxd, luckily I was already recording films I'd watched in the cinema so was easy to import as a CSV file. Took a while selecting watched for ones I could remember I'd seen not at the cinema. Up to 1,016 films logged now. Would be interested in a video game equivalent, more so to find games I wouldn't normally consider playing. This prototype looks amazing, it is exactly what I've been wanting. Some of you on this forum may be aware of one of the best websites on the internet called Letterboxd, a place for film fans to record, rate, and review the movies they have seen. People keep wondering why a trophy system is so important to many players nowadays, and that’s exactly one of the reasons to me. They provide a track record of the things I’ve played over the last 10 years, along with exact time stamps for major achievements. So... It's funny to see this thread. I thought about the same literally years ago and I created together with some friends an app about it. It is called Mekami. I hope you like it. (I guess it is not considered spam if it is as relevant as it seems for this thread). Currently it is an app for Android. 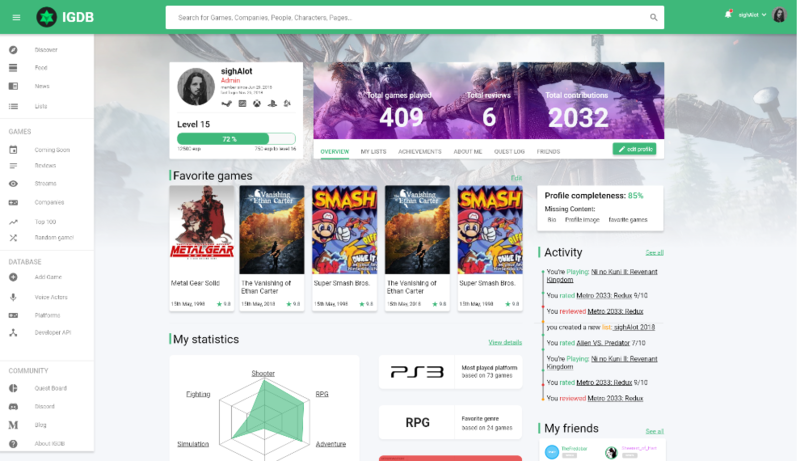 It lets you log the games you play, follow people and get recommendations based on the games you like. You can also keep a Wish List. We are planning to add more functionality like to be able to create any kind of list. More than happy to hear your feedback! Can i ask how you're populating the info on the app? Of course! We keep a cached version of thegamesdb on our servers. Hey, I've seen RAWG being mentioned here. It's been developed for a few years by my acquittances, so I wanted to say a few things about it as well. I've been using RAWG since about 2017, and it's quite convenient I must say. 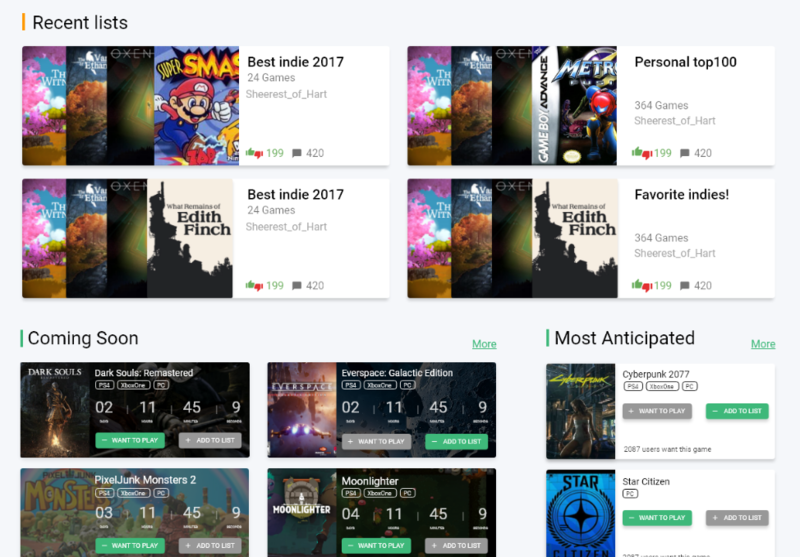 AFAIK its database now is the biggest on the market and they also have an ability to easily edit/add games. The coolest thing there is an automatic sync of the games from your XBL, PSN and Steam libraries (though no love for the Switch, sigh). There's also a fan-made extension for Chrome which lets you sync even more PC stores (Epic Games included). Somehow they ditched the numerical rating system in spite of an emoji one (lolwut). Their reasoning for that is quite rational, though I'm not a fan of it. It is hard to distinguish a 5 from a 6. Some people just rate every single thing they like as a 9/10 and everything they don’t like as a 1/2. Some people think that every score below 5 is just too harsh. All in all, such systems deceive everybody because most people actually use three or four scores implying these meanings — Don’t try it; It’s mediocre; It’s good; It’s great. Our rating system is clear to understand: Don’t play it; You don’t need to play it; Play it; Do play it. 1. You can sync most console games automatically (still no Nintendo, FFS). 2. Lots of lists and other instruments to discover new games. I've flirted with these sorts of things before but my catalog is just too large to be manually entering games. I'd love if you could scan a case and have the game entered easily. When you're referring to GiantBomb though, do you just mean the standard game pages on GB's site, like this page? Not exactly no i was referring to the GiantBomb API, so technically how they allow the info from their pages (like the Spiderman one you linked: the cover, the release dates, description etc.. ) to be reused externally by others. I thought the IGDB was defunct. I recall using that website or something like it back a decade or so ago. So should my user account still be there? Same owners? I noticed a few years ago I started getting a lot of spam on the custom IGDB email address I made. (spamgourmet.com) I figured that the website went under and the owner sold my data. But if the website is still running, perhaps it was hacked? What was the data leakage and do you properly secure passwords on the website? I'll try to check it out soon. That'd be surprising as to my knowledge at least IGDB hasn't been around for that long. The domain would have been acquired in 2012 I think but it didn't really kick off until a while later. I myself joined in 2015. In doubt I should be able to check if you indeed had an account, feel free to DM me your username or email. I don't believe we've ever had leaks or spam issue as far as I know. But if is the case it'd be a concern so I've asked our devs about it! EDIT: double checked and we have no account registered with spamgourmet.com, are you sure you might not be mistaking with a different DB website possibly? Super cinematic gameplay came to mind. It's a shame there isn't more alternatives, tbh. I love letterboxd and I use it every time I watch a movie. Same for an app I don't remember the name for the TV Series. The main feature for me is the "Diary". I love to see all the movies (games) I have watched (played) in a way that let me see how many I played last month, or last year, or whatever. I know we still need to improve it a lot in Mekami, but unfortunately I don't see that option anywhere else. Does anyone know a platform where you can do that? No, my issue was on a website prior to 2013. The way back machine confirms it was never that domain. Must have been a similar one with a similar name... But not that domain. This is what I use. Once you get used to the fairly dense interface, it's probably one of the most powerful trackers out there. It can sync pretty much any library, it pulls data from multiple sources like GB and IGDB, you can create unlimited custom tags with unique colors and have full control over how the tags are displayed. 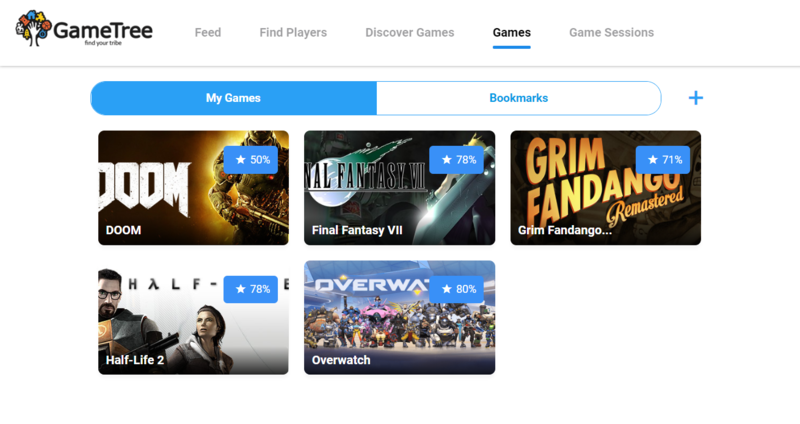 The search features combined with the user tags allow you to create tons of custom views (PS+ games that I've started but haven't finished, Steam games that don't have DRM, co-op games that support split screen, etc., etc.) You can change all of the cover images. It's a great tool that's basically just hampered by the less-than-stellar presentation. I'm the same although I'm more of an imdb user, I rated over 1000 movies there. I did the account connection transfer with letterboxd and it kinda broke because it was so many haha. When I was designing those IGDB prototypes I tried keeping in mind having a 'gaming footprint through the ages ' I want to see stats from my gaming life.. From day 1 whenever it was. With volume then you create cool stats such as most played genre, platforms, series, generation, frequency of completion, average time to beat etc.. It's a long way coming but it'll happen. More of a social/find player sort of app, but i believe it also has some gaming library tracking features. I need to update my OP! Thanks for stopping by sighAlot , New designs look great. I've been using Backloggery for years. I wouldn't mind moving away, but the other site would need to allow me to import my lists otherwise it's too much hassle. I also used another site in the past to keep track of all media called Listal, but the design of the site got more clunky over time. Nowadays I just use Goodreads and Last.fm. 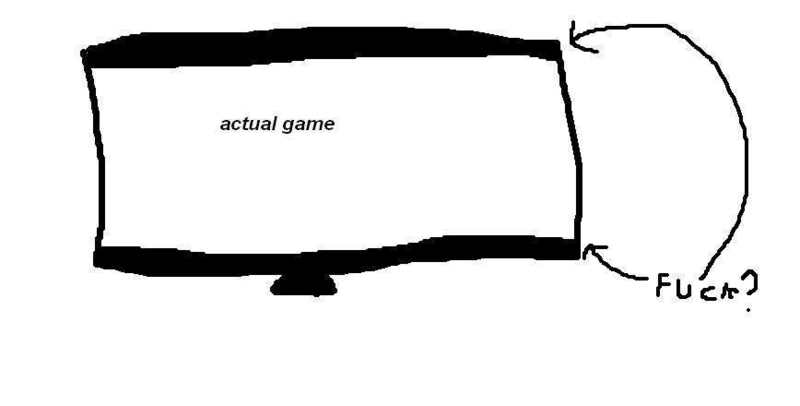 There's a bunch of sites for games like that, Backloggery, How long to beat, Grouvve, etc, most of them don't really have what I'm looking for though. They're often either too barebones or it's over designed and overly complex. Backloggery would have been perfect if it was actually a database instead of an excel sheet, having to enter every entry manually without a link to a game's page is kinda a bummer. I used IGDB for a while, but then I moved to HowLongToBeat, mostly because the information on the average times are very useful. I expected the order 1886. I've been using HowLongToBeat, but I'm not in love with it. Particularly, I don't like that you can only make one custom list. Damn I was just thinking about this and made a thread. Completely missed this one. Does anyone have a link to the ggapp.io app for iOS? Somehow I can't find it. Thank you so much, thought I was going crazy here. The footer is gone when you are signed in, that's why I didn't saw it. I just tried out Letterboxd and it does seem pretty great. The moment it doesn’t have a movie you want to log it feels pretty awful, though. This would probably be a problem for games too, especially as games change or splinter with DLC and updates. If this help, we have coverage of Expansions that can be rated on their own even :) Also DLCs, Bundles, and Standalone Expansions. I hate to be this person but do we have an ETA for implementation of the new IGDB site you posted pics of a while ago? I am really sorry if this is rude in any way. i;m familar with glitchwave because of rateyourmusic but IGDB also looks decent. This seems like something Exophase should handle. Wasnt there like a Raptr site or something that was similar to this?